The TETON Sports Outfitter 4600 Ultralight Internal Frame Backpack is a fantastic large survival Bug Out Bag. Add a Sawyer 3-Way Inline Water Filter and 3.0 liter Platypus Big Zip hydration system and you can theoretically drink up to 1 million gallons of river, lake, or stream water while hiking with this bag. Preppers, especially men should love the TETON 4600 for an everyday hiking and Bug Out Bag. The TETON Sports Outfitter 4600 Ultralight Internal Frame Backpack is very versatile, very adjustable to fit an average to large sized man, has lots of storage capacity and attachment points, and is comfortable and ultra light for its size. There is an integrated rain fly in the bottom of the pack. 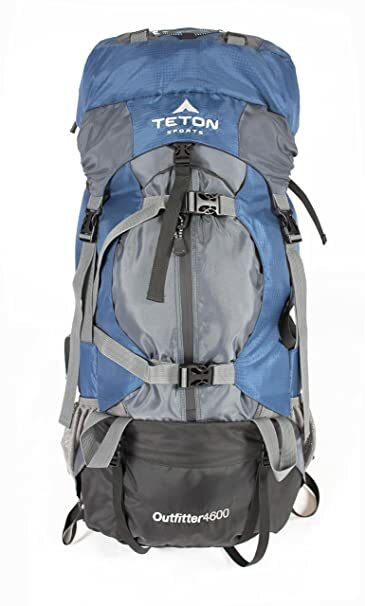 The TETON Sports Outfitter 4600 Ultralight Internal Frame Backpack measures 35.5"x 14.4"x 14". This pack accepts a hydration system and the 3.0 liter Platypus Big Zip Reservoir fits it nicely. If you connect a Sawyer 3-Way Inline Water Filter to the Platypus Big Zip, you can fill the hydration pack directly from a river, lake or stream along the trail, and filter-drink the water while hiking. The Sawyer 3-Way inline Water Filter is guaranteed to filter 1 million gallons. You will never be able to drink a million gallons, so with this bag and the Sawyer water filter, you'll be set for having drinkable water in a long term survival scenario when Doomsday strikes as long as you not stranded in a desert. Check out the YouTube videos below to learn more about this great backpack and the Sawyer 3-Way Inline Water Filter and 3.0 liter Platypus Big Zip hydration system. Every Doomsday Prepper should try on several backpacks to find the best one for them for hiking and survival. Comfort is one of the most important feature. I am a 5'-11" tall man and this was the backpack that I finally settled on keeping after trying on many backpacks from different stores and even more from Amazon that I sent back. After packing your Bug-Out Bag, take it with you (along with hiking shoes) on medium to long car trips away from your home. Better to have it and not need it, than to need it and not have it. Also, it is recommended that you practice and train using your Bug Out Bag until you can get it fully loaded and walk for miles and over terrain to get yourself in shape, and to make sure your hiking shoes are broken in. "Fantastic Outdoor Bag for Hiking, Camping or Prepping. We received the Teton Sports Outfitter 4600 last month and I love it! It's got a huge amount of storage and tons of pockets. Last year we just had a normal sized backpack and crammed everything inside making it very straining on my back. With the Outfitter 4600 we can put all of our gear inside, still have tons of room and it is very lightweight so no backstrain. If your looking for the best of the best, this is it!" "Amazing product! We went backpacking all over Europe with nothing, but these packs, and they were awesome! They were great quality, comfortable, and had tons of room for everything we needed on our month long trip! Definitely recommend!" "I purchased this bag for myself and must say I'm thoroughly impressed. Plenty of room and rides comfortably, would definitely recommend for someone looking for a good hiking bag that doesn't break the bank." "One AMAZING Backpack. I've been using this pack for about a year now and it's been out on several trips into the woods and the local mountains. The light weight material Teton uses is excellent and very tough! It's been banged against trees, drug through thick underbrush and rained on...only to come out fine. I've found that it's easy to clean and the added rain cover is a nice touch as well. Be prepared not to use the cover if you have enough gear attached to the outside of the pack. The coolest thing about the pack is the amount of storage you have and the numerous attachment points that are available for hanging and strapping in gear. The sleeping bag compartment is bigger than my Teton Explorer 4000, so it takes a full size bag with little to no difficulty at all. If you use a compressed mummy bag, you can even squeeze in a wool blanket at the same time, pretty slick! I have slammed in just over 40lbs earlier in the year for some comfort camping and found the pack to ride comfortably on my back while hiking for miles around one of our local lakes. Oh, being able to access your gear that may be in the middle of the pack via side zippers is VERY handy too. Along with the numerous compression straps and and adjustments, it's pretty much impossible to find something to complain about..not to mention the great price. Easily 5 stars." "I bought this to get ready for my backpacking trip to the UK and Ireland. So far, I love it! The main compartment is very spacious and I love all the pockets and places on it. I especially love the little compartment on the waist strap for my cell, etc. I also love all the buckles to help keep everything all cinched and snug. The separate fanny pack is an added bonus. It is huge and can carry much...."
"Great lightweight pack. Been using this pack for over two years now. Been through about 100+ miles of Appalachian hiking plus a few airplane trips (as a checked bag). It has made it through all the above with no problems whatsoever. My only complaint is the top compartment can flop to one side if not cinched really tight, not a huge deal but I have had to stop a few times to tighten." The following YouTube video by Teton Sports thoroughly explains every feature of the TETON Sports Outfitter 4600 Ultralight Backpack. The following YouTube video is a good review of the TETON Sports Outfitter 4600 Ultralight Backpack. The following YouTube video explains why the TETON Sports Outfitter 4600 Ultralight Backpack is one of the best backpacks for the cost. Teton Sports Outfitter 4600: Best Budget Bug Out Bag? Hiking Backpack? The following YouTube video is a review of the 3.0 liter Platypus Big Zip Reservoir hydration system. The following YouTube video is a review and demonstration of a Sawyer 3-Way Inline Water Filter paired with a 3.0 liter Platypus Big Zip SL. The 3.0 Platypus Big Zip in this video is the SL model. You can alternatively purchase the flatter fitting LP model. Either will work with the filter. The LP stands for "Low Profile". It has a seam down the middle of the bag to stop it from bulging in the center and it lays flatter in your pack. The SL only has one chamber so cleaning it may be slightly easier than the LP. I like the LP, but others may prefer the SL.